Stevenson-Hamilton’s Identikit Photo. Or Something Like That. With no train or driver at his disposal. The use of the train from Sabi Bridge was taken away from Stevenson-Hamilton, the new warden of the Sabi Game Reserve to be stationed at Sabi Bridge. The warden was forced to first use a push-along and then a hand pump rail trolley for transport, as you can see from the photos. The lower picture was taken around 1907, sporting his team along with Ranger Thomas Duke. These trolleys were generally used as transport for maintenance teams on the railway lines and sometimes to repair and maintain telegraph wires along the tracks. According to Stevenson-Hamilton, his weekly trips shopping for supplies at Komatipoort took him around five hours down the line and as he put it “twice as long to return”. 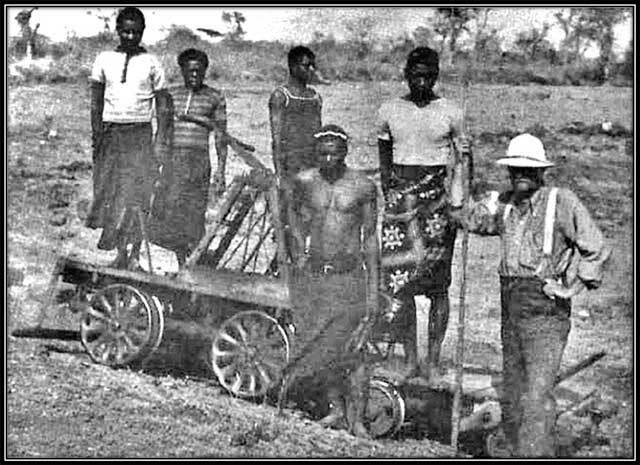 Using the first trolley, the time was days and depended on the energy, weight of cargo and willingness of his team for the up journey back to Sabi Bridge. 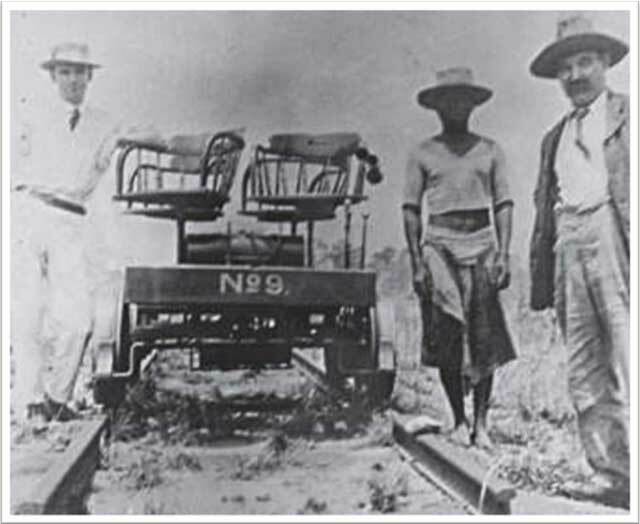 There are two photos of trolleys that Stevenson-Hamilton used; the third photo is the one on display at the Skukuza Station today and not one he used, but a more recent addition. 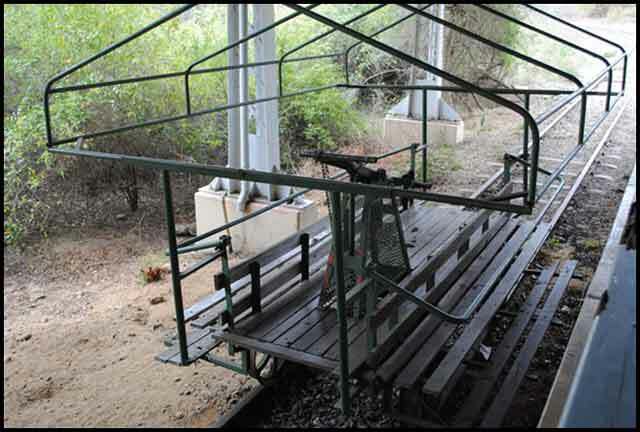 It is said that this third trolley was used for transporting tourists a short distance down the line or across the bridge for sun-downers or quick tours and the start of this tradition you will read about further on in our adventure. There were two wardens and some game rangers appointed and commissioned before 1902, but for this story we will stay with the stayers as we knew them then. The Vereeniging peace treaty was signed in May 1902, marking the end of the Anglo-Boer War, when Harry Christopher Wolhuter was decommissioned. Harry was born in the Cape Colony and migrated as a child with his parents to Legogote, bordering the reserve on the west side. Now 27 years of age, he joined Stevenson-Hamilton as the first official game ranger of the Sabi Game Reserve in August 1902 and was stationed at Pretoriuskop. Harry Wolhuter had been a farmer and storekeeper in the Lowveld at Legogote before the war and during the war he had been a sergeant with the famous Steinaecker’s Horse outfit. Harry was also the only one of nine troopers to survive black-water fever on a British hospital ship in Delagoa Bay. This would stand him in good stead on the evening of August 1903 when he was attacked by one of two lions while riding his horse on ranger duty near Satara. One lion jumped onto his horse’s flanks and the reactive force threw him out of the saddle to fall right on top of the other lion, which summarily sank its fangs into his right shoulder and proceeded to drag him a distance of 94 yards – later measured – over rocky ground. To worsen his wounds, his spurs were digging into the ground, causing them to be pulled off by the lion jerking its head to pull harder. The other lion went after Harry’s horse, which in the skirmish got away with his dog Bull hot on its heels. While being dragged a sense of despair came over Harry, thinking this was not a nice way to die – and still so young. All of a sudden, he remembered his knife at his right side and the same side the lion had him by the shoulder. Hoping it was still in its sheath and in extreme pain, he gingerly reached round with his left hand under the lion, desperately trying not to alert the lion that he was still alive. Hope of all hopes, he caught hold of the knife handle and like a drowning man clinging to a piece of driftwood, he hung on. After drawing his hand back, he slowly positioning himself and aimed at where he supposed the heart to be. Strangely, as Harry aimed for the heart, the lion stopped pulling, dropping him to the ground. But the lion remained standing over him, this he saw as his only chance. With frantic speed and torturous effort, he struck twice into its right side. Then with equal speed, he went straight for its throat. The lion sprang back gushing blood over Harry as it did. Scrambling to his feet, still tightly holding his adapted (Joseph Rodgers) carving knife he stared at the lion and it stared back. It was Harry’s turn to roar and roar he did, using every kind of abusive language he could think of, he let it out as loud as he could, in an effort to drive the lion back. The lion backed off, slinking into the darkness – himself now losing a lot of blood and in obvious pain. Anticipating the other lions’ return, Harry immediately climbed a suitable tree to 12 feet, strapping himself to a branch with his belt, in case he passed out from loss of blood. It was not long and the other lion showed up, with his dog Bull still snapping at its heels. The lion, smelling blood and seeing Harry in the tree, tried to climb up but Bull kept it occupied from behind. While this was happening, he heard the jangling of tin pots, a short way off. These pots hang around the pack donkeys’ necks and reckoning they must be his, he shouted to his rangers to fire shots to frighten off the menacing lion. After Harry’s rescue, he still went eight miles back to camp with the second lion following all the way, also hoping for a crack at him; meanwhile, his horse had made it back alive and it was he who had alerted the rangers. The lion Harry stabbed, died a short while later with two holes in the heart as discovered by the rangers who skinned the lion for Harry’s trophy the next day. It took three days to get Harry to Barberton hospital, a distance of 260 km (150 miles) through wild bush all the way, on arrival he had still not had any pain killers or treatment to any of his wounds. Torn and full of blood poisoning, this man was an unrecognizable mess to look at when he arrived and only being the survivor he was, did he live to serve another 43 years in the Kruger Park. In December 1902, came Thomas Duke – native name M’Xhosa, a language he spoke having come from the Cape Coast – to be stationed at Lower Sabi. In May 1903, Cecil Richard de Laporte joined the other two and was stationed at Kaapmuiden. It must be said that Gaza Gray – native name M’stulela – was the first game ranger of the park but he was in fact under a private arrangement and therefore unpaid. In mid-1902 he had requested the warden to act as an honorary ranger and be paid in grazing for his cattle; in so doing, he was never considered employed as a ranger for the record. He ran the eastern part of the reserve between the Sabi and Crocodile Rivers from the Selati Line to the Mozambique border in the south. A substantial area to patrole on horseback. Then in May 1903, adjoining the northern boundary of the Sabi Reserve along the Sabi River, the Shingwedzi Game Reserve was proclaimed. This new reserve was to form the northern part of the Kruger National Park, being above the Sabi and all the way to the Limpopo River. Warden Stevenson-Hamilton was appointed to administer this new game reserve as well, to his great joy, considering he was largely instrumental in getting it proclaimed in the first place. It took four months of preparation before he had the pack donkey’s and supplies he needed to inspect, which happened during September and October. Although finding it scarce of game, he considered it ‘well worth protecting’ for the future. Some background of the warden to understand him better. Major James Stevenson-Hamilton was a Scot, although born in Dublin, Ireland on 2 October 1867. He came to South Africa from Scotland in 1888, where he serve in the 6th Inniskilling Dragoons, stationed in Natal, having been educated at Rugby and the military academy of Sandhurst. After a short stint in South Africa, he left the military in 1898 to explore more of the continent. His explorations took him as far as the Kariba Gorge by boat and later Barotseland on foot, then trekked across Northern Rhodesia to the Kafue River. In 1899 he returned to Natal and the British military, to fight in the Anglo-Boer War – where he became a Major in 1900 – until 1901. Stevenson-Hamilton was an independently wealthy man, owning large family estates near Glasgow. He spoke neither Dutch nor any African languages and yet Sir Godfrey Lagden, Commissioner of Native Affairs – stationed in Pretoria – in charge of the Sabi Game Reserve project, saw in this man the qualities needed to make a success of this new, National Game Reserve, he was hoping to establish in the Transvaal. Lagden’s position changed in July 1905, when Native Affairs was relieved of its appointment of the Sabi Game Reserve, which was then transferred to the Colonial Secretary’s Office. The warden and maybe the Kruger Park had been very fortunate to have had Sir Godfrey for those three short years, in which the reserve had become established and set up. Well, if anyone said Stevenson-Hamilton was wrong for the job, they were in for a huge surprise. For one to say that hostilities, political and otherwise, were not a problem for this man, would have been very disappointed in every way. This short, forceful, astute man has to go down on record as being one of the toughest, kindest, most comprehensive and accomplished men in all of South Africa’s history. Digressing a little and considering all the odds Stevenson-Hamilton faced for the cause of nature, I cannot think of anyone – and I think you will agree – more suited to have accomplished what was done for the Kruger National Park and wildlife in general, than what this man did. A short bit of history here. In 1902, seeking a civilian post after the Anglo-Boer War, Stevenson-Hamilton applied for the job of game ranger for the Sabi Game Reserve and was commissioned as warden on July 1st of that year. Although the peace treaty had been signed, the reserve and in fact, the entire region was still under martial law with Col. Steinaecker, breathing fire, his corps still in charge. Except for WW1, and a short time after his service in the war, and even though he had his own wealth to fall back on, Stevenson-Hamilton continued as an active civil servant at low pay for nature and its protection until his retirement in 1946.